My flowers finally bloomed and I am so excited about it. 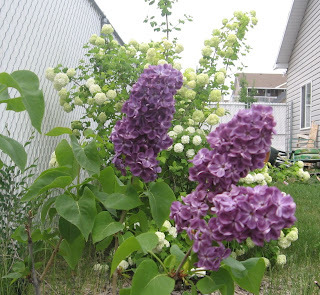 The lilac in front is my favorite with the white around the edges. In back we also have the snowball bush in the background of the pic. 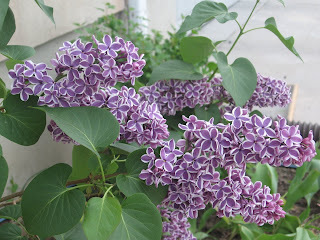 I just love it when the lilacs are in bloom. When we walk, you can just smell them in the air. Too bad they don't last all summer. The kids have school till next Friday. I can't believe how fast this school year has gone by. A little while ago, I discovered via another blog a video of some crazy complicated Rube Goldberg machines that were created with household objects. The video was Japanese and we had no idea if it was a commercial or a clip from a TV show or what. Here is a compilation of a bunch of them. I did some searches on Google this weekend and discovered that the videos are part of a show called Pythagora Switch. It appears to be a kids show that teaches science and stuff. I guess Rube Goldberg machine in Japan is called a Pythagorean Device. I found an episode on Google Video. I hope you like it.